preset list for fast loading + saving sounds. 1 sine + 1 noise Osc. Osc2/noise: Color = basic tone. the most flexible drum module. presets:HH, BD, SD, toms, percussion. 2 sine + 1 noise Osc.Sine1 is master over sine2. Osc1: Tune:overall tune. Osc2: detune relative to Osc1 (>toms). 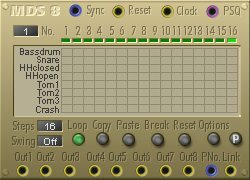 presets: bd, toms, and other percussion. loads *.wav or *.aif files. 8-instrument drum module by Fra77. sine/square/sawUp/sawDn/tri/noise wave => 12dB bp filter. with 2AD EGs for pitch and filter mod and 1AD EG for amp mod. carrierFrq, 2xmodulatorFrq, modulator mod amount, modulator EG attack + decay times, gain. with pitch mod input + amount control, att, hold and dec mod inputs + amount. gain + gain mod controls; time range for Att,Hold and Dec 0-9.3sec. as above, but samples / wave files are not remembered by Modular preset list. not exactly a drum module. it’s a phase modulation module with 2 multiOscs, 2 ADs, a dsp delay and a 24dB lp filter. osc2 controls the delaytime of the dsp delay. 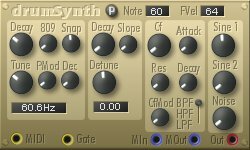 CWmodular modules have mod inputs for some (basic) parameters.